On Monday, I had the opportunity to attend at wine tasting and winemakers dinner, involving the Santa Barbara County Vintners Association. My wife and I attended as guests of the Grape Encounters radio program. 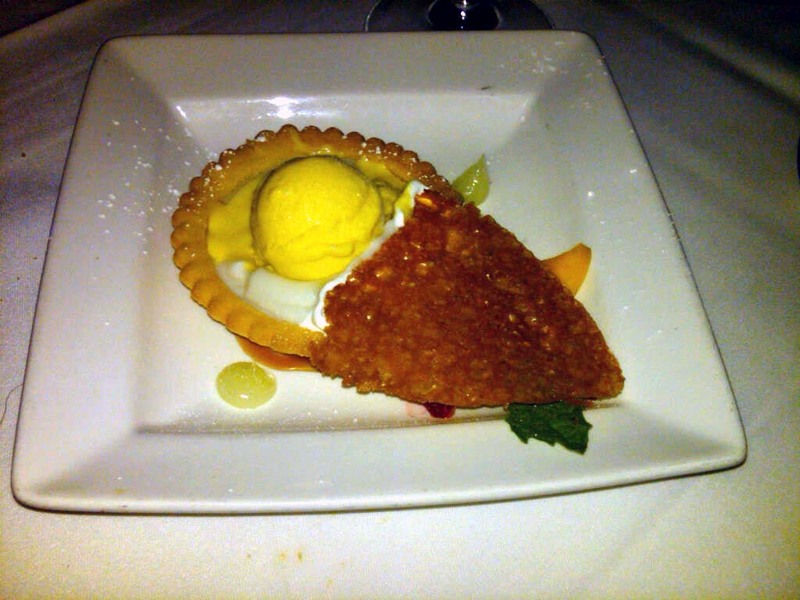 The tasting was held at AKA Bistro, in old town Pasadena. It's been a long time since I've been to the area, and it is a really great restaurant town. The weather was sunny and hot, about 100 degrees when we arrived at about 4:00pm. After finding a parking spot, we wandered over to the quaint alley, where AKA Bistro was located. By the time we arrived, the venue was buzzing with activity. Check in went smoothly, and we were given a booklet outlining the winemakers in attendance. Each page left enough room to take notes on the wines tasted. As soon as we entered, I caught site with a winemaker friend of mine, Brandon Sparks-Gillis, from Dragonette Cellars. I met Brandon, on a fluke, about four or five years ago as he and the Dragonette brothers had just finished destemming a load of Syrah grapes they had harvest earlier that morning. We were actually there to try Ampelos Wines, but after our tasting, Brandon asked if we'd like to try his wines. 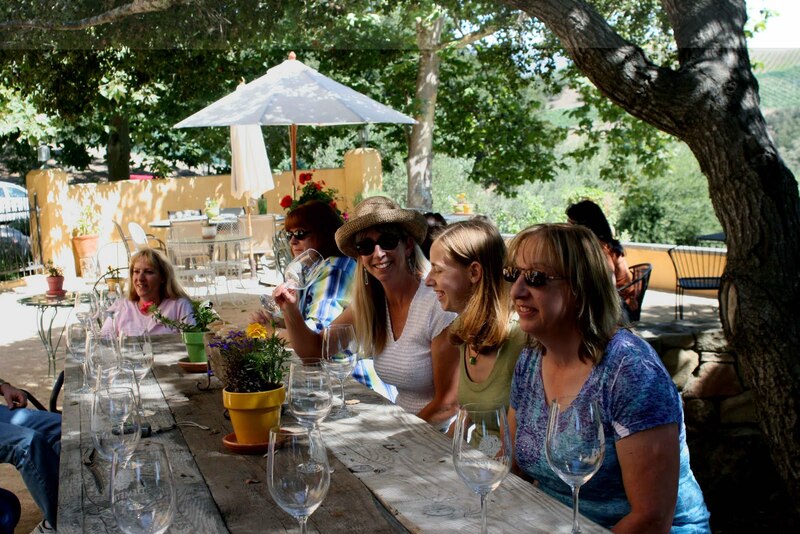 From then on, I have been a follower, and adamant supporter of Dragonette Cellars. Their wines are excellent, and the tasting at AKA Bistro was no exception. They make an excellent Sauvignon Blanc, which not too many winemakers in California can say. He also served me his newest creation: Grenache. I'm not a big Grenache fan, but those of you who do like the variety, are going to love this one. There were a total of 20 different wineries represented at the tasting. They included some of the well known, and not so well known brands of Santa Barbara: Arthur Earl, Babcock, Bedford, Dragonette Cellars, Fess Parker, Hitching Post, Jaffurs, Kenneth Volk, Lafond, Melville, Mosby, Municipal Winemakers, Palmina, Qupe, Riverbench, Sanford, Santa Barbara Winery, Tercero, Verdad, and Zaca Mesa. There were large groups of people around almost every table. Fess Parker was getting a great turnout, but it may not have all been for their wine...they had an air conditioning vent right above them. Hitching Post, Zaca Mesa, and Kenneth Volk also seemed to draw the crowds. There was no way to get to every winery, much less try the different wines presented at each table. Some of the highlights of the tasting involved the more unusual varieties. 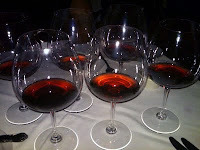 I tend to like wines that take a bit of risk, and are different than the norm, so it's no surprise that I was focused in on the blends, and unusual varieties, and stayed away from a lot of the standard Syrah, Chardonnay, Pinot Noir, and Cabernet Sauvignon. Some of the wines that stood out, and might be worth the search, or visit to the winery to purchase were: Bedford Winery Riesling (dry and aromatic); Hitching Post Rose (unusual, made with Valdiguie and Pinot Noir); Kenneth Volk 2009 Negrette Cales Vineyard San Benito (an unusual grape that is something between a cross of Pinot Noir and Syrah); Mosby Sangratino and Mosby Lagrien; Palmina Nebbiolo (I wish they had brought some of their Santita...one of the best dessert wines I've found in California); and of course Dragonette Cellars Sauvignon Blanc and Syrah. 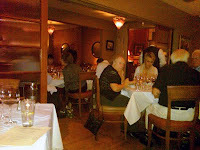 The tasting ended around 6:00, and the group was so large, the winemakers dinner had to be split between two sister restaurants. We left AKA Bistro, and drove back east to Bistro 45, where we were seated in an air conditioned room (thank goodness, as the heat was too much). There were about 100 guests seated for the six-course dinner, which included 10 wines, and visits from the winemakers to each table. The best pairing of the night was the second course which consisted of "house cured salmon with orange blossom vinaigrette and lemon-verbena panna cotta, paired with the Qupe Rousanne Bien Nacido Hillside 2008. 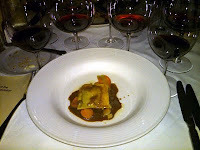 The other pairing that stood out was the roast sirloin of beef with a beef "ravioli" paired with the Lafond Syrah/Grenache Santa Rita Hills 2007. During the dinner we met with Gray Hartley (Hitching Post), where he poured one of his library wines, a 1997 Hitching Post Pinot Noir. We also had a nice discussion with Stephen James (Melville) and Arthur White (Arthur Earl). We were also entertained by some amazing card tricks, performed by Chef Anton. Dessert - "Coconut Cream Pie"
Always a fun time meeting with the winemakers, and then seeing how a chef interprets the pairing of the wines with his creations. 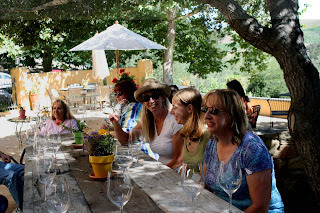 Next time you're up in Santa Barbara County, check out any of these wineries, I don't think you'll be disappointed. A fun event, made even better by attending as a guest of Grape Encounters...thanks David Wilson. I often get e-mails from friends asking wine questions. Usually they are wine recommendations, or wine/food pairing questions. This week, I received one from a friend of mine, and I thought it might be worth expanding on. His question, "Quick question...,maybe? 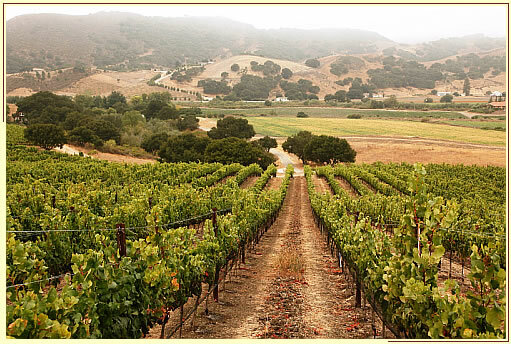 In your opinion, where on the west coast of the U.S. is the best Zinfandel grapes grown?" My response was that "best" is pretty subjective, but that I could narrow that down a little bit. First, California has the "best" Zinfandel, and to narrow that further, I think there are a few regions that do a good job with it: Paso Robles, Lodi (and the Sierra Foothills), and Sonoma/Napa. Zinfandel has always been referred to as California’s native grape, but that is impossible, as there are no Vitis Vinifera grape varieties that are native to the Americas. It is now thought that it was brought to California during the gold rush, and probably came from the East Coast, via imports from Europe. It is directly related to Italy's Primitivo grape and probably a descendant of a Croatian variety known as Crljenak Kastelanski. DNA evidence is now supporting this theory. While California gets all the attention, Zinfandel is grown in at least 15 other states in the U.S., as well as small production in Australia and Mexico. Zinfandel is a late ripening grape, so a long growing season is needed, but doesn't respond well to continuous warm weather. Diurnal temperature changes are needed (warm days and cool nights). Soil also makes a difference, as Zinfandel is subject to bunch rot. Well drained soil is ideal. Many of the old vines around the Lodi and California river delta are planted in sandy, well drained, soil. Harvest is a crucial time for Zinfandel. It is an uneven ripening grape. Within a bunch, you may have ripe grapes mixed in with green grapes and even raisins. The best wineries will make multiple passes through their vineyard to pick only the ripe grapes. Zinfandel also is a high sugar grape, so when fermented, those sugars can convert into a large amount of alcohol (have you ever really looked at the alcohol levels on your bottle of Zinfandel?). With those high sugar levels comes lower acidity, and softer tannins. This helps to emphasize the dark fruit notes that are so typical of Zinfandel. Zinfandel is one of those unique grape varieties that can be made into different styles. From white Zinfandel, to fruity, to spicy to dessert wine, Zinfandel covers the field. Since Zinfandel is a fairly light colored wine, it is often blended with Petite Sirah, which adds a little depth of color. The Sierra Foothills has a reputation for big, full-bodied Zinfandel. These extra-ripe wines are characterized as "jammy, briary, and brambly", having aromas of sweet berries. Sonoma County contains the warm Dry Creek Valley AVA, known for its juicy Zinfandel with bright fruit, balanced acidity and notes of blackberry, anise and pepper. 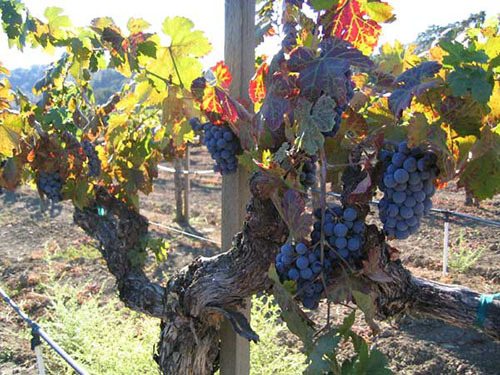 Dry Creek Valley AVA produces Zinfandel in a variety of styles ranging from the high-alcohol style to balanced, spicy wines. And, the Russian River Valley AVA has a lot of "old vine" Zinfandel acreage. These wines are known for their spicy and somewhat lower alcohol wines. During cooler growing seasons, the Russian River Zins may have difficulty ripening, and produce their best wines during warm vintages. Paso Robles with its hot days and cool evenings, produce Zinfandel known for being soft and round, but often very high in alcohol. Napa Valley produces Zinfandel wines described as plummy and intense, tasting of red berry fruits with cedar and vanilla. Lodi has some of the oldest Zinfandel vines in California. While often used for White Zinfandel production, in the red style, Lodi Zinfandels have a reputation for being juicy and approachable. 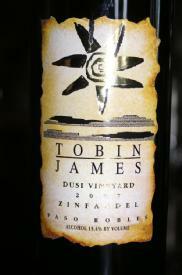 Lodi is also producing some of the finest "port style" dessert wines from the Zinfandel grape. So, to answer the question of "best"...it would have to be determined by the style you like. I like Tobin James. They seem to make the most of these different styles. You can get full blown "fruit bombs" with their Fat Boy, or drier spicier styles with their Ballistic. I happen to like their Dusi Vineyards label (or anything coming out of Dusi Vineyards)...as it is a nice cross between spicy and fruity. My wine club just had a Zinfandel from Napa (Buehler Vineyards) and it seemed to be the favorite of the night. One of the nicest Zinfandels I've had was Ancient Peaks, however they are hard to find, and even when you go to their winery, their inventory may already be depleted. If you look at wine ratings, the Russian River, Dry Creek, Napa Valley, Paso Robles and Lodi seem to get the high ratings, but again, it depends on what you like, as to which region is the "best". Please share your favorites, by adding comments to this post. Last week I conducted a blind tasting for our local wine club. I had five red wines, all in bags. Included with the tasting were notes for eight different red wines. 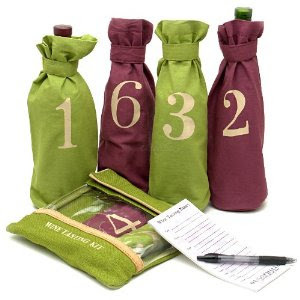 The challenge was supposed to be figuring out what wines were in each of the bags. Earlier in the week, I visited my (not so local) wine store, to find "classic" examples of single variety wines. I knew that I wanted a Cabernet Sauvignon. Since we are in California, I went for a Napa Cab, in particular an Oakville Cab. My biggest challenge was finding a good example that was within our club budget. 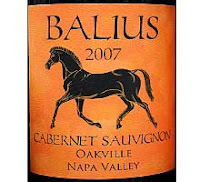 We have always concentrated on wines around the $20 range, but this has been getting harder as we see prices going up. But, I did find a nice one: the 2007 Balius Oakville Cabernet Sauvignon. This wine had a lot of oak in it, so much of the fruit was masked. The tannins as well as some of the earthy notes, you find in Rutherford Cabs, made this a fairly obvious variety to determine. Of course, if I did a Cabernet Sauvignon, then I would have to do a Merlot, to see if people could really distinguish the difference between these two grapes that are so entwined together. I decided to go with the 2008 Chateau St Michelle Indian Wells Merlot. Well, I thought I was buying a 100% Merlot, but I come to find out that they added a little Syrah to the Merlot to make a bit richer mouth feel and add more fruit character. As it turned out, this was the wine that most people got correct in the blind tasting. Next choice was a Syrah/Shiraz. I debated going back to California for a Paso Robles Syrah, but decided that the high extraction and even higher alcohol that is so typical, might not be the direction to go, so I narrowed it down to a Rhone Syrah or an Australian Shiraz. Again, cost constraints led me towards the Australian version instead of the classic Rhone wines (that I personally love). I ended up with the 2008 Penfolds Bin 128 Shiraz, from Coonawarra. I didn't find the "meaty" notes that I usually find in Syrah, but it did have some pepper, but also a lot of "green" notes that didn't seem to sit well with a lot of the tasters. This was probably the least favorite in the blind tasting, but also the biggest surprise, as most had tasted this wine before. I decided to throw in another grape that I thought most Californians would figure out...Zinfandel. With this grape, I could go all over California and find different styles. Personally, I find Zinfandel one of the hardest reds to determine in a blind tasting. Other than the high alcohol, and medium tannins, everything else can vary: from fruity to spicy, and even sweet to dry. 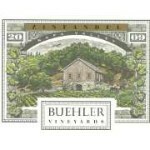 I chose the 2009 Buehler Zinfandel. This Napa Valley Zin had a nice blend of fruit and spice, but could have benefited from a bit of age. At first it was very tight, but as I swirled the glass, it really opened up. This was actually the favorite wine in the blind tasting, and the only one I ran out of. My last wine had to go back to the old world. Would it be a Sangiovese, Tempranillo, or Nebbiolo? Have you seen the price on good Chianti or Barolo lately? The choice was Rioja (and Tempranillo). The next question was traditional or modern style? Since I love the traditional style, where the wines are released, ready to drink, after being aged at the winery...I chose the 2004 Baron de Ley Reserva Rioja. To me, this was the most obvious wine in the bunch, but as I learned, most people at the tasting drink mainly new world wines, and could not figure out what this was. However, it just so happens that one of the guests at the tasting was from Rioja, Spain, and this was as obvious to her, as it was to me. I found this to be a wonderfully smooth wine, with notes of tobacco, cedar and blackberry. At the end of the night, I revealed the wines we had tasted. Some people, who never drink Merlot, are now fans, and others liked the unique flavor the Rioja. I still think that blind tastings are a bit of a "parlor trick", but the goal wasn't to try an determine the exact grape, winery and vintage. the goal was to get people to think about what they were tasting, and notice the subtle (and not so subtle) differences between the grapes. Goal accomplished! It's an important time of year in the northern hemisphere....an important time, that is, for grape growers and winemakers. If you have been to a vineyard in the last couple weeks, you probably saw a lot of little hard green berries on the grape vines. If you go back today, you may notice something has changed. Véraison [vay-ray-ZON] is a wine term which refers to the onset of ripening. It is French word, but is used throughout the wine world. 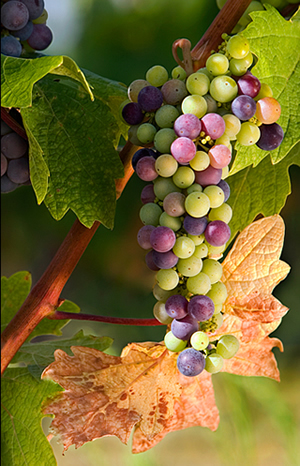 The official definition of véraison is "change of color of the grape berries." Véraison represents the transition from berry growth to berry ripening. In the northern hemisphere, véraison typically occurs anywhere from late June to mid August, depending on the climate. Here is a short video from Adopt a Grape, discussing the importance of véraison in the vineyard. Veraison '08 at Adopt A Grape from Adopt A Grape 2009 on Vimeo. Following fruit set, grape berries are green and hard. They have very little sugar and are high in tartaric and malic acids. They begin to grow to about half their final size when they enter véraison. During this phase the colors of the grape change from green to red or yellow, depending on the variety. For those big on science, this color change is due to the chlorophyll in the berry skin being replaced by anthocyanins (red wine grapes) or carotenoids (white wine grapes). The berries start to soften as they build up sugars. 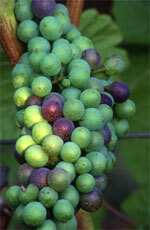 Within six days of the start of veraison, the berries begin to grow dramatically as they accumulate glucose and fructose and acids begin to fall. If you were to look at a graph of acid versus sugar levels, you would see that véraison occurs when the decrease in acid crosses over the increase in sugar. The acids are actually being "burnt up" by the respiration of the grape berry. If you want to get into great detail on the actual science, check out "Wine Science Principles and Applications" by Ronald S. Jackson, or "Knowing and Making Wine" by Emile Peynaud. Both books are very technical. Some wine growers will perform a green harvest, where less ripe bunches are removed. The idea is help concentrate all the energy into the remaining berries, which in turn, should produce more concentrated wines. There is a bit of a gamble however, namely if the remaining time between véraison and harvest experiences severe drought or excessive heat, the result could be dry berries, which produce unbalanced wine. So, when you visit the vineyard this time of year, you'll see growers checking their crop. They know that once véraison starts, they are only about 45 to 50 days from harvest. And that can be 45 to 50 days of holding their breath! Let the countdown to harvest begin! Cabernet Sauvignon. How well do you know this “noble” grape? You would think that Cabernet Sauvignon was the most planted red grape in the world. 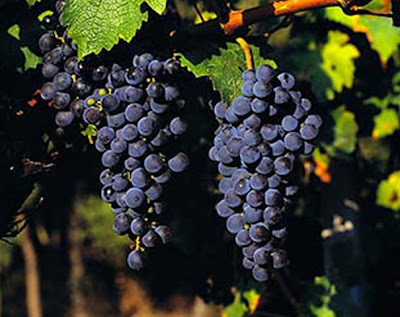 There is little argument that some of the most expensive wines in the world are based on the Cabernet Sauvignon grape. But, it is actually Merlot that wins the race with vineyard plantings. The origin of Cabernet Sauvignon has been in dispute, but recent DNA testing shows that it is actually a cross between Sauvignon Blanc and Cabernet Franc. The grape is thick skinned, with small black berries in loose, long bunches. The grapes have large pips (seeds) and tough stalks, which add to their natural tannins (that gum drying sensation you get). Since Cabernet Sauvignon buds late and ripens late, it needs a fairly long growing season, and well drained soil, which really limits the places it can be planted. The most well known region for Cabernet Sauvignon is Bordeaux, France. More specifically, the left bank is where the gravelly, warm soils are perfect for the grape. Napa Valley, in California, came out of “nowhere” in the 1970’s, beating the French in the famous Paris tasting of 1976. The alluvial soils of Napa produce structured wines with ripe, black fruit. The area of Rutherford (in Napa) is also noted for its “Rutherford Dust” on the palate. Two regions in Australia are noted for their Cabernet wines too. Coonawarra (with its red “terra rossa” soil) and McLaren Vale, are producing fruit forward red wines. We are seeing some great Cabernet Sauvignon wines coming out of Washington State, Chile, and Italy. The grape is grown in many other regions of the world, but these are the areas that we find most likely represented in our local wine shops. In the winery, Cabernet Sauvignon typically has long contact with the skins, pips (and sometimes stalks) during the fermentation process. This leads to heavy extraction of color and tannins. Traditionally, Cabernet Sauvignon was blended with Merlot, to add some richness to the mid-palate, but now we are seeing more and more 100% Cabernet bottlings and blending with other local varieties (Sangiovese in Italy, Tempranillo in Spain, and Shiraz in Australia). Most Cabernet wines have extended oak aging in oak barrels, but newer techniques (and cheaper ways to produce low cost wines) have led to oak chips, or even oak extract being added to the wine. The oak adds some spice, or vanilla flavors to the final product. Most top wines will benefit from some extended bottle aging (and can improve in the bottle for decades), but the newer styles of Cabernet Sauvignon, are meant for more immediate consumption. In the glass, the wine is typically ruby or purple (depending on the age) and somewhat opaque. On the nose, you should be able to pick up black cherry, blackberry, cassis, bell pepper, tobacco, and in California and Australian wines, eucalyptus or mint. The wines are going to be medium to high acid, tannin, body and alcohol. Cabernet Sauvignon is a big wine, and can overwhelm light or delicate foods. 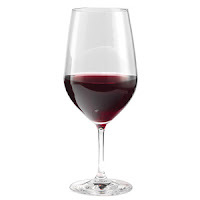 The Classic wine and food matches are going to be fatty red meats (where the tannins are neutralized by the fat, allowing the fruit in the wine to come through). Typically beef and lamb are the most desirable. Meats that utilize mild spices, like black pepper, pair well with Cab since the mild spices help to minimize the perception of tannins. Bitter foods, like endive or cooking methods like grilling can also counterbalance the tannins. Some strong cheeses, like aged cheddar, Brie or Camembert work well, as does bitter dark chocolate (remember, your wine should be sweeter than your dessert, so the more bitter the chocolate, the better). Also, different regions, of production can affect your food pairing. Old world wines tend to be earthier, and can pair well with mushrooms. Cool climate Cabs will have a more noticeable vegetal aroma and flavor, so vegetables are a possibility. New world wines are more fruit forward, and usually higher in alcohol (so stay away from hot spices, which will elevate the heat levels). So what are your favorite Cabernet Sauvignon based wines?